" This outlet completes two problems at once. 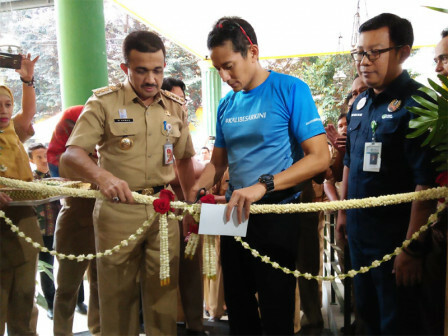 That is by preparing products at very affordable prices and creating new jobs"
Jakarta Deputy Governor, Sandiaga Uno, inaugurated the OK OCE Farm Outlet at the Agricultural Training Center Building, Klender Urban Village, Duren Sawit, East Jakarta, Tuesday (8/7). "This outlet completes two problems at once. That is by preparing products at very affordable prices and creating new jobs," he expressed. It was the result of collaboration between Jakarta Maritime, Agriculture and Food Security Dept. (KPKP) with PD Pasar Jaya, PT Food Station Tjipinang Jaya, PD Dharma Jaya. There were 25 UKMs that took part in opening a business. He targeted 20 outlets that can be built and also uses city's land. In that occasion, he took the time to review the existing outlets. Among them belongs to PD Pasar Jaya, PT Food Station Tjipinang Jaya, Cow's Milk Pondok Ranggon, etc. He also witnessed the signing of a memorandum of understanding in collaboration with PD Pasar Jaya and Jakarta Maritime, Agriculture and Food Security Dept. "In the outlet, locals and KJP holders can shop safely and comfortably," he told. Jakarta Maritime, Agriculture and Food Security Dept. Head, Darjamuni uttered that the outlet itself was originally served as flower marketing, Rawa Belong Branch, West Jakarta. This was the second after previously being in Pasar Minggu, South Jakarta with a turnover of Rp 50 million. "We're optimistic that this outlet helps the people in fulfilling cheap groceries," he stated. PT Food Station Tjipinang Jaya President, Arief Prasetyo Adi added that he was committed to distributing various food staples with good quality and low prices. "All products marketed are much cheaper. Talk about supply, is also quite safe. People are free to shop at this outlet," he said.